Asyril's integrated flexible feeding module represents a turnkey solution for the reliable, fast and precise feeding of a near infinite range of bulk parts and components. System integrators looking for an easy-to-integrate feeding system capable of supplying a large variety of products and materials need to look no further. The Feeding System can handle parts smaller than 0.1mm and up to 10mm in size and has proven its reliability and efficiency in various applications such as watchmaking, medical products and electronics. 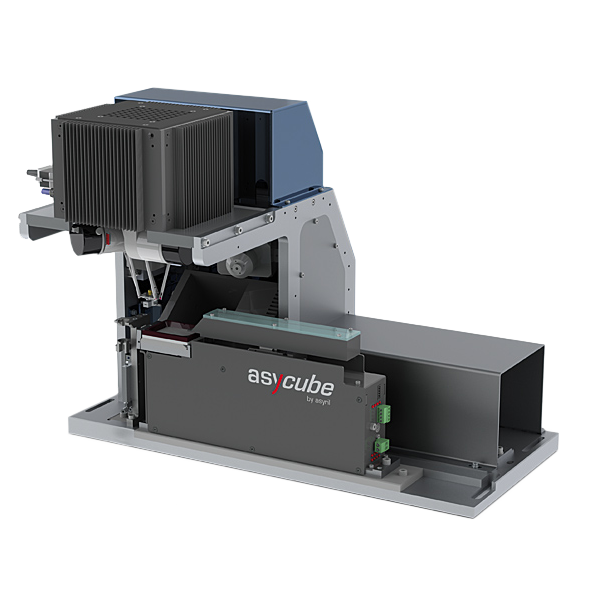 Optimally combining an Asycube vibrating platform with a high performance visual- and integrated robotics system, the Module can be easily configured and integrated into any automated production line through Asyril’s Feeder Control Center software. A semi-automatic tool-changer mechanism is included by default. The perfect solution for automating any feeding, sorting and palletizing tasks – part changeovers are as easy as loading another program! The Asyfeed Pocket Module requires minimal maintenance and can be easily combined with countless PLC’s, allowing system integrators and machine builders to easily build high performance, innovative flexible feeding systems. The flexible feeding module includes an industrial control PC and is delivered fully assembled.